Being in the state of mindfulness and awareness may help you discover the matter listed below. The one that resonates most is presumably your implicit reason. Gathering other psychological suggestions, it is also said that by doing nothing, we say “no” to rushing, uncertainty, pressure, fatigue (take your pick). Even though this type of boycott is unconscious, its undesirable impacts impede greatly. From this point of view, plunging into paid essay writing with no preparation is a promise to stumble upon its pitfalls one day. Nevertheless, experience is the mother of wisdom, and landing paper writing work at home is exactly what gives you the first one. One can express a hidden shame through procrastination: everything is fine until there is a need to demonstrate a result to others. Owing to low self-esteem, depreciation prevails and inner criticism becomes engaging. This threat of depreciating makes you put off finishing the job over and over. While writing an essay for job, you should get ready to receive critical commentaries and apply the requested changes without shame or fear. In fact, down deep, you probably don’t want to be the first. Both a fear of responsibility and negative transfers (marks of past bad experience) may be the causes. In addition, the first person is not only the winner, but also the one who bears much more responsibility and makes more mistakes. It is always easier to follow the old path. If you have had negative connotations in the past, it might reflect on today’s way of acting, bringing about an unconscious desire to flee. It is likely to mean that a situation is still to be resolved in your mind and you are yet a hostage to an issue. This work may demand a huge internal input to settle it once and for all. However, sometimes more serious traumatic incidents should be resolved, but only with the help of professionals. Writing a freelance essay, you might be tempted to copy-paste already-existing content or an idea. Eventually, both variants are doomed to failure and will lead to bad outcomes. 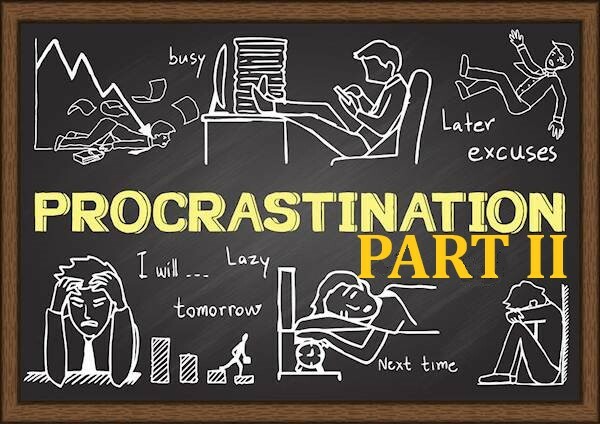 Besides, sometimes procrastination can silently imply that you have hidden desires or repressed emotions, such as anger, a thirst for revenge, or aggression. In this case, we make other people wait, leaving them in ignorance, uncertainty, and anxiety. The most curious explanation on the matter is provided by Jung’s archetypes theory. The concept of a shadow as the hidden power of our dark side can not only explain a human’s phenomena, but also dramatically broaden a viewpoint. On top of this, James Hollis’ book “Why Good People Do Bad Things: Understanding Our Darker Selves” is what can allay existing doubts and make considerable input in individual awareness. To a certain extent, it is also an indirect way to express power: the one who makes other people wait becomes a dominator, unconsciously striving to be exempt from a subordinate role. Unfortunately, if a person does not have enough mental strength to protect his or her interests openly, he or she may act this way. The last but not least, you probably did not want to do it from the very beginning. The interest and desire could fade away quickly, whereas the obligations are yet to be fulfilled. The energy of commitment does not suffice, and eventually you put things off. Your desire “not to do” something prevails until you face a fear of punishment. In this case, the reluctance to take actions simply yields to the fear of punishment or to undesirable consequences. Besides, you probably can’t help encountering another triggers for action, such as a fear of disapproval, a guilty conscience, and a sense of shame. Neither willingness to progress, nor satisfaction will come after completing a task. Ultimately, there is nothing but relief from a terrible burden. Should it be this way? Have you found a case of yours? If yes, it is high time to renew your mindset, goals, and desires. After this, writing an essay on job, you will feel the difference in terms of pace and outcome. Having broken free of destructive processes in your mind, the needed results will follow.